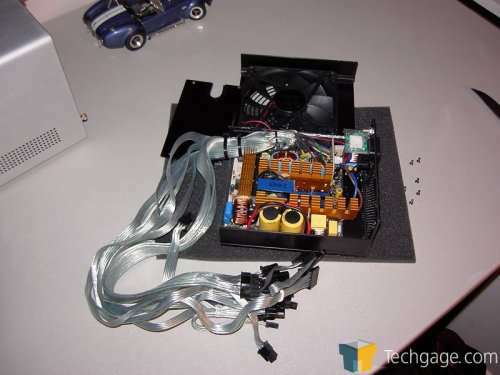 Power supplies come in just about every conceivable configuration. High wattages, single 12V rails, dual 12V rails, triple, quad. You name it, you can find it. One of the newer things we’re seeing here in the states is active PFC (power factor correction). 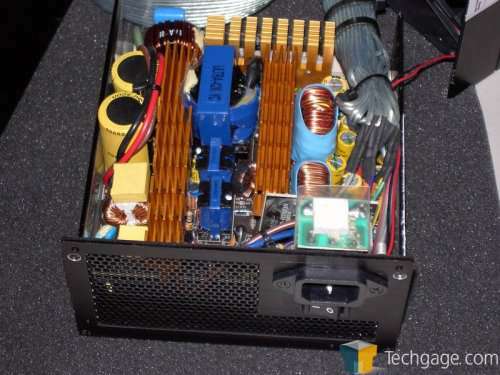 Today we take a look at an existing PSU that’s been souped up with APFC and a hidden difference. 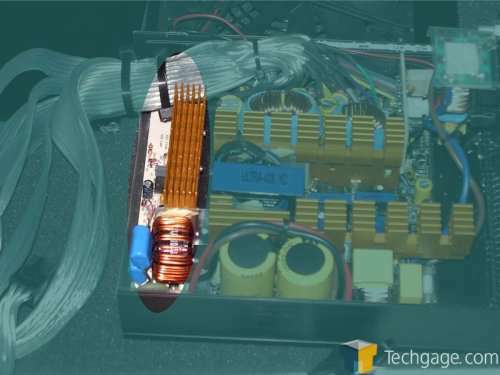 This is why we’re seeing the uber wattage PSU’s making so much headway today. They split the loads up over more rails and keep the loads evened out. The 500 APFC shakes things up a bit though. Instead of running just the CPU(s) off the 12V2 rail and everything else off the 12V1 rail, Ultra has wisely divided the PCI-e loads over both rails. This means that you can easily load a pair of 7900GT’s, a dual core CPU, multiple drives, fans and lights and not have to worry about pushing the 12V1 rail out of spec. Yes, you’ll be running the 12V2 rail right at the edge of it’s 16A limit (both rails combined are good for 384W or 32A/2) but running it at that load in today’s PCs is not unrealistic. 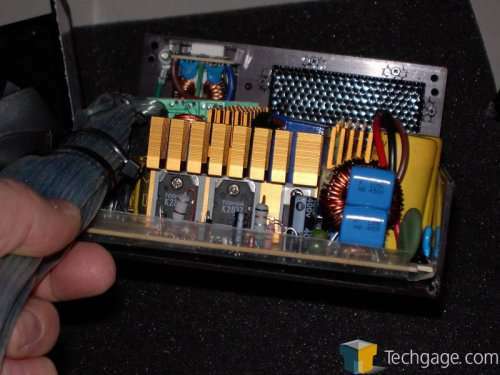 The beauty part is that Ultra even labels each PCI-e connector so that you can decide how to load the PSU if you’ve only got a single card. The 500 APFC features a split aluminum chassis which helps to add a bit of visual appeal to the unit and lightens it up a bit. 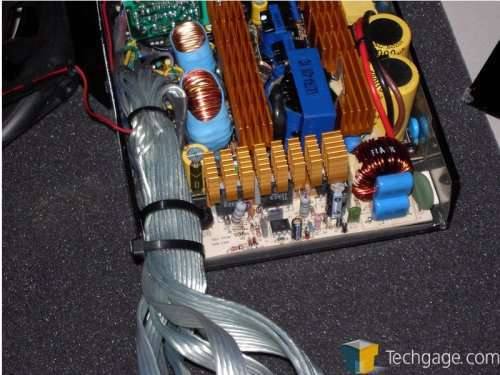 It also adds the APFC circuitry to the front of the PSU. This is something that’s added to the existing X-Finity 500W so it’s largely unchanged other than the rerouting of the rail loads (I’m assuming). The end of the PSU features an inset punched steel grill rather than just a drilled endplate. I personally think it looks pretty slick and gives it a bit of a modded look.